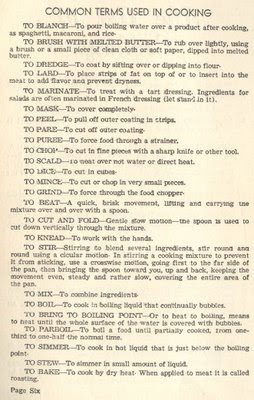 A list of common cooking terms from the pages of The Amarillo Garden Club's Blue Ribbon Recipes book -- as always, click to read larger scans. How many did you recognize? 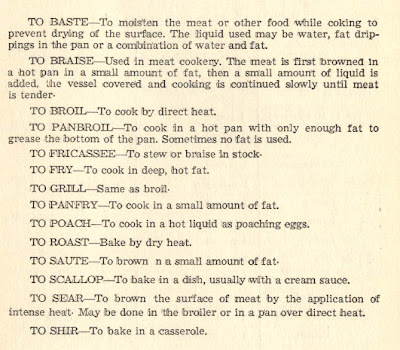 I'd never heard of "to lard" or "to shir" before. I hadn't heard of 'to lard' either. I just love your blog. Good job. And here's something for fun if you'd like--you've been tagged for a 6th picture meme. Here is what you are supposed to do: The rules are to go to the 6th folder on your computer, find the 6th photo, post it, describe it, and then pick 6 blogger friends to play.